Editor: A small number of editor settings are not configurable per file type, but are always used regardless of which file you're editing. 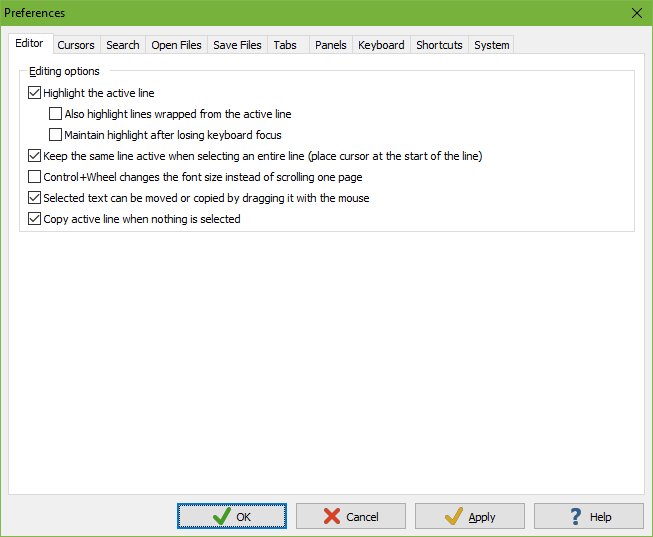 These include whether the active line is highlighted, whether you can zoom with the mouse wheel, and whether you can drag and drop text with the mouse. Cursors: Most text editors use the standard Windows text cursor (blinking vertical bar), which is often difficult to spot, particularly on a medium gray background. EditPad Lite allows you to change the color, shape and blinking style of the text cursor, making the cursor easy to spot. You can set the cursor to indicate insert or overwrite mode like most DOS editors used to do. Like the text cursor, the standard Windows mouse pointer for edit boxes is a ridiculously thin I-beam. EditPad Lite allows you to use a custom I-beam or arrow pointer with one or two contrasting colors for maximum visibility. 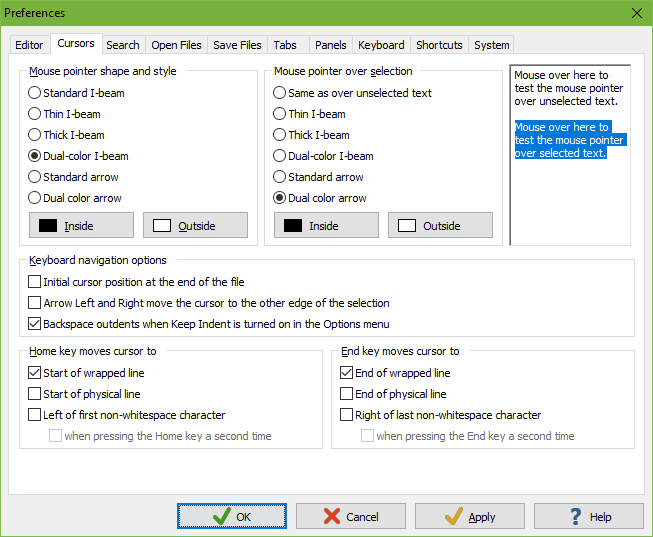 EditPad Lite offers a range of options that affect how the text cursor moves and/or the text is scrolled when you press the arrow keys or other navigation keys on your keyboard. Search: When a search fails in EditPad Lite, you don't get a dialog box that you have to dismiss. The search button that you clicked will flash its image. You can choose to make EditPad Lite beep as well. 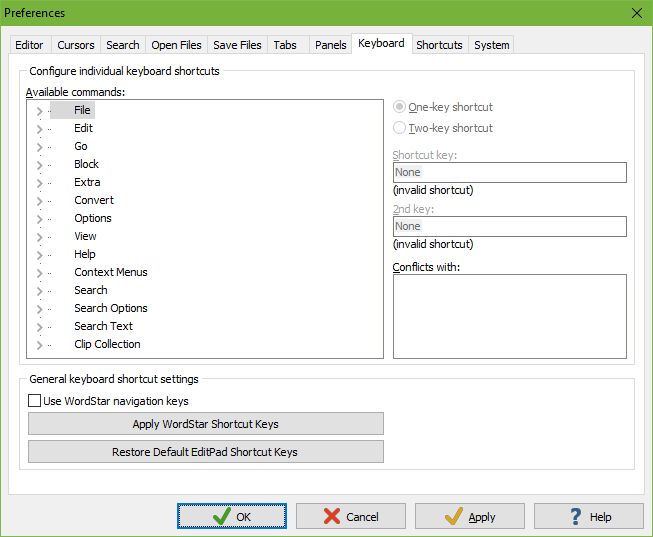 When you press Ctrl+F, EditPad Lite can use the selected text as the default search term or as the text to be searched through. You can make a double-click on a word in a file highlight all occurrences of that word in addition to selecting the word. 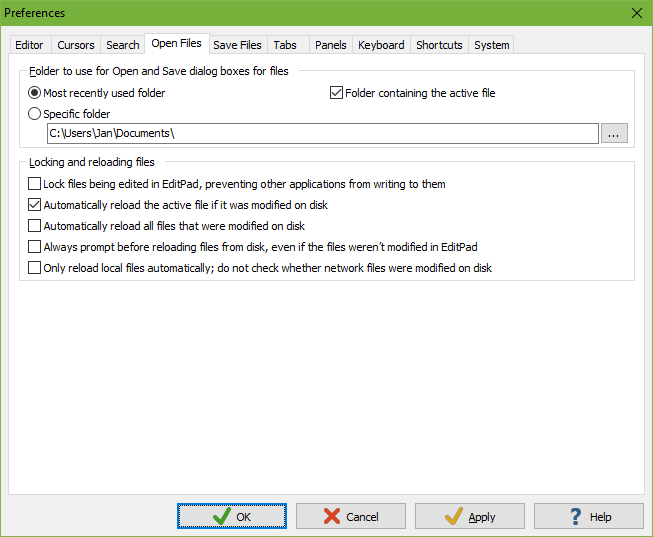 Open Files: EditPad Lite gives you several option for the default folder for the Open and Save dialogs. 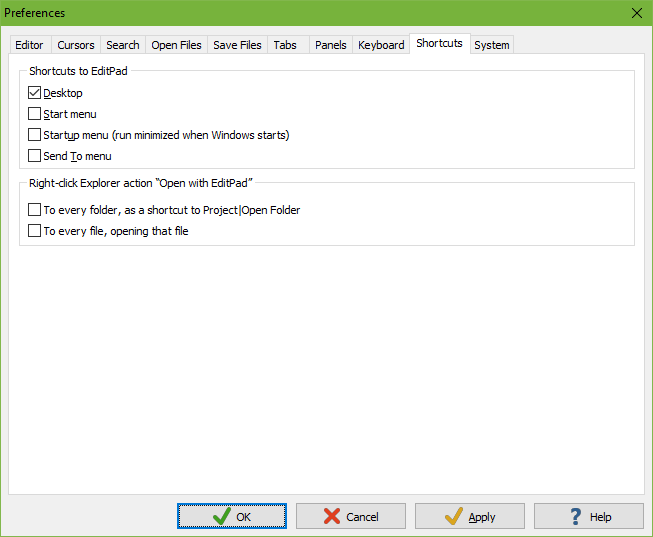 Choose a fixed folder, or let it depend on the active file, active project and/or last used folder. Save Files: Protect yourself against data loss with a wide range of automatic save and backup options. 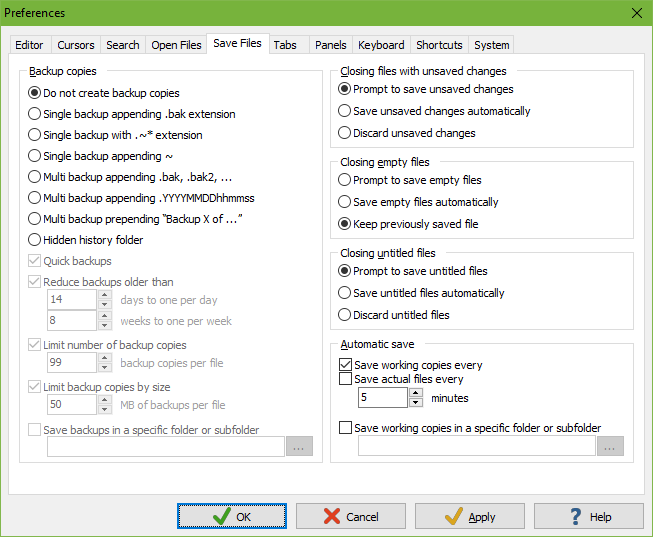 Choose how many backup copies EditPad Lite should keep, how long it should keep them, and in which folder or under which names it should keep them. Tabs: In 1996 EditPad was one of the first text editors sporting a convenient row of tabs for switching between files. Configure the colors of the tabs, hide them when they aren't needed to save space, or disable them entirely if you prefer to use the handy file management sidebar. 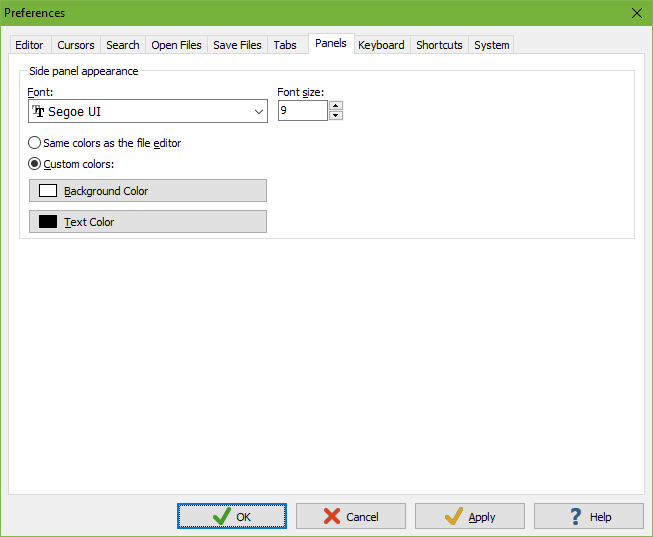 Panels: Configure the font and colors used by EditPad Lite's side panels, such as the clip collection and file navigator. Statusbar: EditPad Lite's statusbar is fully configurable. You can choose to display any or all of 14 indicators, in the order that you prefer. 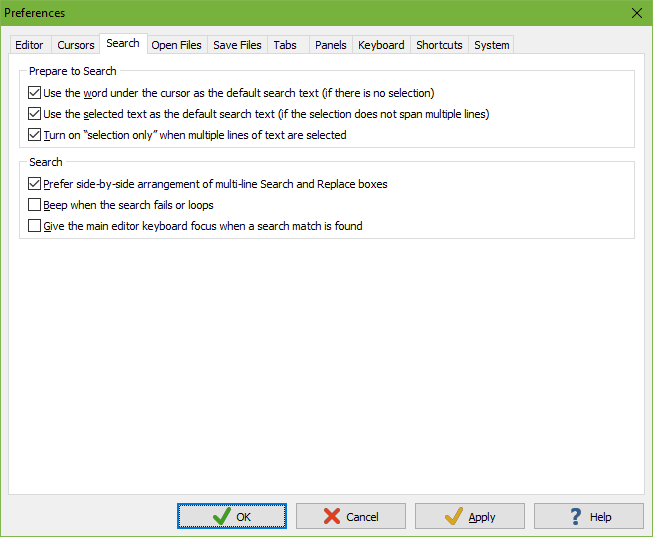 The indicators show information about the current file's properties, the position of the cursor, the character at the cursor, the size of the selection, the editing mode, and the status of the keyboard. Shortcuts: Have EditPad Lite create (or remove) shortcut icons on the desktop and various other places so you can quickly start it. 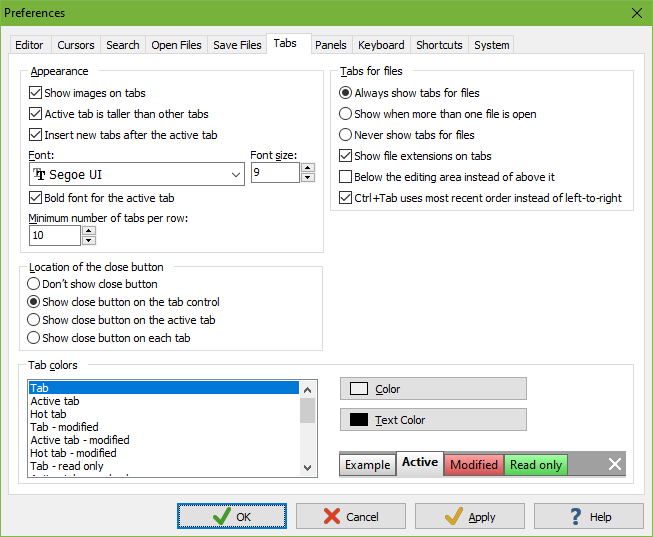 Add an "EditPad" action to the right-click menu of all files and/or folders in Windows Explorer to quickly start editing any file. System: If you share your computer with other people, protect your privacy by having EditPad Lite delete potentially sensitive history information. Have an EditPad Lite icon always visible next to the system clock, keep the taskbar button visible or not, or make EditPad Lite work as an ordinary Windows application. 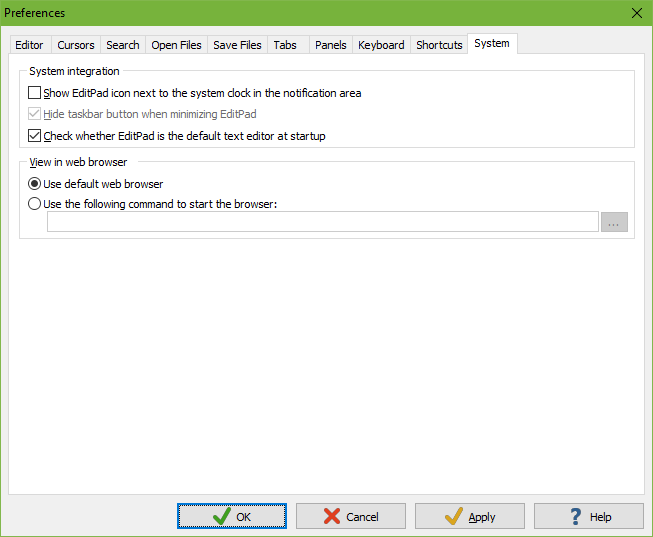 You can also configure your web browser if you don't want to use the default browser.